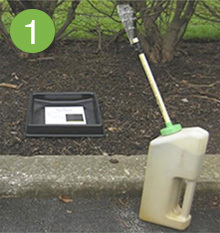 Brickman’s Joe Ketterer shares five pointers for lawn care applicators to increase efficiency with landscape bed weed control. 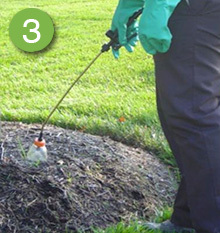 When it comes to effective and efficient application techniques for landscape bed weed control, Joe Ketterer has a few shortcuts up his PPE-approved, long-sleeved shirt. Ketterer, a certified pesticide applicator with a bachelor’s degree in ornamental horticulture from Pennsylvania State University, is a 30-year veteran of the Brickman Group. He serves today as a regional production specialist for the Rockville, Md.-based national landscape company, providing in-house training and research/development capabilities in the areas of labor, materials and equipment. Ketterer presented, “Best Practices of Weed Management in Landscape Beds,” during an April webinar hosted by Landscape Management and sponsored by Nufarm. 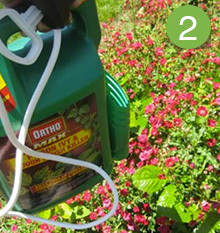 He covered many of the basics, such as the importance of reading pesticide product labels, but he dove deeper to encourage attendees to think differently about product selection and application techniques. 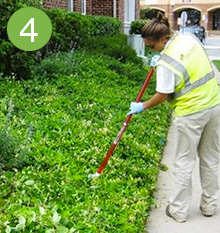 Regarding techniques, Ketterer offers five tricks to make landscape bed weed control applications easier. ACME Spred-Rite granular spreading tools are a staple in Ketterer’s operation for precision granular material application in beds (typically preemergent herbicides). The standard tool comes with a green plastic paddle and a clear plastic tube. Ketterer has aluminum paddles custom made to “bulletproof” them for commercial use and extend their life spans. Many lawn care operators (LCOs) overlook consumer-oriented, store-bought pesticides, but not Ketterer. He likes to keep a few jugs of this type of specialty product at the ready for specific situations, such as treating an unexpected poison ivy patch. Keeping in-house prepared products on hand is an alternative; however, it’s important to remember bottle labeling requirements and to keep the product labels and MSDS on the truck. When working in beds, it’s vital to protect nontarget plants adjacent to spray areas. Ketterer does so by modifying the top of a 32-ounce sport drink bottle and affixing it to the end of a spray wand to create a drift guard. He starts by cutting the bottle along the top ridge and drilling a hole through the bottle cap (slightly smaller than the spray tip threads). Next, he removes the spray tip from the wand, screws the bottle cap onto the wand and replaces the spray nozzle. Finally, he screws the trimmed bottle into the bottle cap. At that point, if the plastic interferes with the spray pattern, he’ll remove more of the plastic. “You can buy a drift protector for $7 or $8 apiece or make one with a recycled sport drink bottle in under two minutes,” he says. 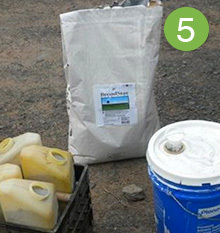 Filling Spred-Rites with granular herbicides directly from product bags can be tricky, causing spillage and waste. Ketterer recommends using a 5-gallon paint bucket with a lid and pour spout to keep the product dry and make the task easier. It goes without saying that lawn care professionals always should follow personal protective equipment requirements listed on pesticide labels, says Joe Ketterer, regional production specialist with the Brickman Group. Still, everyone needs a reminder, he says. Here’s his must-have safety gear checklist.